Despite growing globalization, parenting techniques around the world continue to vary widely. 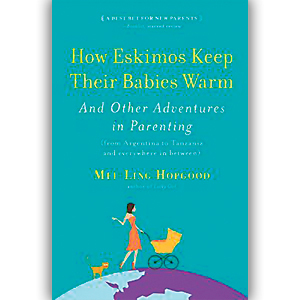 In How Eskimos Keep Their Babies Warm by Mei-Ling Hopgood, she blends research, interviews, and personal experiences to prove there are many ways to be a good parent. In my first blog on this book, I looked at the following chapters: “How Kenyans Live Without Strollers” and “How the Chinese Potty Train Early.” While most of the title is directed towards moms, the chapter, “How Aka Pygmies Are the Best Fathers in the World,” ended up captivating me the most. According to Hopgood, the Aka are a community of approximately 30,000 people living in the forest that border the Congo and the Central African Republic. Hopgood explains, “They are among the last true hunter-gathering people on earth.” Hopgood references the work of anthropologist Barry Hewlett, author of Intimate Fathers: The Nature and context of Aka Pygmy Paternal Infant Care, when she relates how Aka children spend equal time with both parents. Apparently, “Aka dads harness their babies in infant slings and take them on hunts, babysit when moms need to set up camp, and bring them along when they let off steam with the guys at a palm-wine happy hour,” Hopgood explains. While more and more research is showing how children benefit from time spent with their fathers – more sociable, adaptable, and better performing in school – Hopgood reports, according to the Fatherhood Institute, of the 156 cultures studied only 5% helped fathers be closer with their little kids. A perfect example of this is paternal leave. Hopgood relays, “The United States is one of the stingiest of the world’s wealthy countries when it comes to any kind of paternity leave…placing last with zero weeks of paid leave required by law and twelve weeks of upaid leave only for employees of firms with more than fifty employees. By contrast, Sweden offers dads two months paid leave, according to Hopgood. She writes, “If daddy didn’t take it, the family would lose it.” As you might imagine, 85% of Swedish fathers take paternity leave. When my first daughter was born, I was teaching in New Jersey and able to secure my pension if I finished out the school year, so my husband, a Federal employee, took paternity leave. He still considers those months as some of the best in his life (and will frequently tease that all her achievements stem back to their time together ;-). While our declaration that my husband was on paternity certainly turned a few heads, it’s something I wish every dad and child could experience. So if you’re up for experimenting with your tried-and-true traditions, check out Mei-Ling Hopgood’s How Eskimos Keep Their Babies War. Her chapters on “How Polynesians Play without Parents” and “How Mayan Villagers Put Their Kids to Work” are really interesting as well. You might not be ready to adopt all of their practices, but at the very least, you’ll have a world of new ideas.